I write this fresh off a trip that took me from Cleveland to Helsinki with a brief stop in Copenhagen and then to London. It’s been almost 10 years now since I’ve been speaking on the topic of content marketing in and around Europe. Over that time, content marketing has become a driving force, maybe THE biggest change I’ve seen in the approach to marketing around this continent. It is slowly evolving from a product-centric to a more audience-centered strategic approach. And yet, just as we’ve seen in the United States, marketers in Europe tend to overcomplicate the idea of content marketing. There is still a belief that we need to be everywhere our customers are on the web. That we need to be on all social platforms (like it or not). That we need to be distributing our stories 11 different ways every day. That we need to create viral content (don’t get me started on that one). When I take the stage telling marketers in Finland and the United Kingdom to slow down, to choose channels carefully, possibly desert publishing on some social media sites, and to simplify their strategies, I often get pushback. “My management expects us to publish on every platform,” I hear again and again. “We need immediate results” is a common pushback. All I can advise is that you should zig when everyone else zags. Let your competitors waste their time and resources publishing more and more content, while you go out and build a loyal audience that will reap rewards for years to come. Remember, more content does not mean more assets. The asset is the audience, and the content is what gets you to the asset. If you are a marketer who has a handle on your content marketing approach, this post will serve as a review. 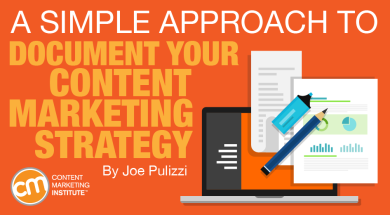 For everyone else, you can use this to help you document a content marketing strategy that you can present to your team and continue to refine. You need to answer the following questions as you proceed with any marketing approach, but they will be particularly helpful for a content-first approach. What is the challenge? What business challenge (specifically) are you trying to solve? What is your dream outcome of this approach? What is the risk if you fail? Who is involved? What permission do you need from your managers to participate? What if things go wrong? What is your plan if you don’t achieve your goals quickly enough, if there is a customer complaint, or if other problems arise? How long do you have to show success? These are broad questions for a reason. They are intended to get you into the right mindset before you start to talk about any type of content creation. How big of an opportunity is it? Is this opportunity big enough to warrant spending your time and/or money? How will the initiative align to your business objectives? With your existing marketing? What are the risks? What sources could prevent you from achieving the goals? Which of those things can you control and minimize the likelihood of their occurrence? Now that you have a feel for the problem you are trying to solve for and the reason to create content in the first place, you can begin to focus on the persona. What content or information do they need as it pertains to this plan? How will this help your audience with their job or life in some way? What unique value proposition (UVP) do you offer this persona? What differentiating value do you bring to the table? You want to highly scrutinize the content. If the information isn’t truly differentiated, with limited competition, there is little chance you will break through and gather attention. What is the content niche you are planning to cover? What other companies provide this kind of information? Do you even have an opportunity to become a leading resource in this area? How do you find out? Can you purchase an existing external asset instead of developing a new one? Where will you find the stories in this content niche? Who in the company has the expertise to help? What internal assets and other content do you already have? What resources (staffing and otherwise) will you need? What key design issues will make or break the program? What platform makes the most sense to distribute the content? Will this be a new content brand or woven into an existing product or company brand? How will the information be found by the audience? What current assets do you have to distribute the content? What partnerships can be leveraged? Is there paid budget available? How will you know the initiative is successful? What subscription tools will you use to capture audience information? What key assets need to be created to capture the necessary data? What other departments should you bring in to maximize impact? What technology are you missing for enabling collaboration and measurement? What are “must-haves” and what are “nice-to-haves”? What internal communication will you need to make sure the program gets and keeps buy-in? How quickly, considering the buying cycle, can you tie the initiative to sales, cost savings, or customer loyalty? What internal issues need to be worked out so you can tie the subscribers to revenue? While there are more questions to be asked, answering the above will uncover the opportunities and gaps in your overall plan. Now, you can take this information and create a business statement, which will serve as an elevator pitch for the overall project. Here’s an example. Problem: The mechanical engineers (our key buyers and key leads) gathered from our traditional marketing processes often come to us very late in the buyer’s journey. Even if the sales team can break through and get a meeting, we are trying to win the business solely on price and not on value. Thus, yield has been significantly impacted over the past 12 months. It has become a significant management concern. Solution: If we can build a loyal audience of mechanical engineers by developing an amazing awareness experience for our brand, we will be able to bypass the RFP process, increase the quality of our leads (pulling leads from our subscriber base), and earn more business without competition or product discounts. After reviewing all possible content avenues, we believe that a blog/e-newsletter combo would be the most appropriate. The initial plan is to create two blog posts per week (Tuesday and Thursday, with a Saturday e-newsletter) until we see a minimum of 5,000 subscribers to the e-newsletter. Once achieved, we will increase frequency to three times per week. The incentive to sign up for the newsletter will be a free sample template for the design/build process. This was already developed by another department, and we have its approval to redesign and share it as an extremely valuable download. We believe that the 5,000-subscriber mark is achievable in six months with adequate promotion leveraging our current database and partnering with outside media organizations. Considering a buying journey of six months, we believe that we’ll start to see yield impact at about the eight-month mark of the program, with the ultimate goal to increase average yield per sale by 15%. Considering the budget and resources needed for this program, we believe that with new business and the overall yield impact, the program will generate 5.5 times ROI in a 12-month period. What you just read is the kind of one-page report you would present to your management team. Obviously, you’ll add things like a content marketing mission statement, team structure, distribution plans and more. But in this case, the goal is only to get your strategic thoughts on paper so that you have a solid business plan and hypothesis for moving forward with this opportunity. And remember, this plan is not set in stone … it can and should be updated regularly. Want to receive daily insight to help you create and regularly update your content marketing strategy? Subscribe to the free CMI newsletter.